This is the ultimate nitrogen gas charged shock absorber. With its twin tube design and 10 stage velocity sensitive valving, the ES9000 delivers not only a smooth, comfortable highway ride but it also enhances off road handling and performance. Engineering for heavy loads as well as the most demanding driving conditions. Its 1-3/8" nylon banded full displacement piston head and double-welded shock mounts ensure maximum strength and long lasting durability. 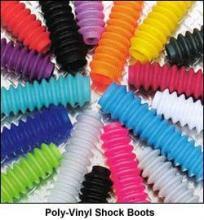 Optional shock boots sold separately and available in 16 colour choices. These units are ideal for raised suspensions on most 4WDs. They are available in a huge range of lengths to suit both popular and modified 4WD situations - especially suited to vehicles with raised coil or leaf springs. The twin tube cellular gas design is engineered to substantially improve driving comfort and performance both on and off road. With its 10 stage velocity sensitive valving, the ES3000 self adjust to various road conditions, while improving your vehicle's handling characteristics. The large 5/8" chrome hardened piston rod and unique Teflon rebound stop delivers a comfortable highway ride and the ability to handle the most demanding driving conditions. With double welded shock mounts for maximum strength, and the exclusive Pro-Comp limited lifetime warranty, the ES3000 will ensure ultimate performance for as long as you own your vehicle. This product is ideal for most 4WDs and is more economically priced than the ES9000 range. These steering stabilizer systems are specifically engineered to improve handling characteristics and reduce wheel vibration, which leads to suspension component fatigue and failure. Available in single or double shock configurations, the stabilizing systems are designed to help reduce bump steer problems caused by oversized tyres and/or rough roads. 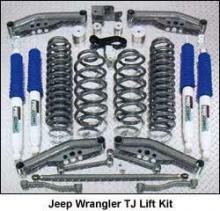 These kits feature raised coil springs and long travel ES9000 gas shock absorbers. They allow greater ground clearance and the fitment of larger diameter tyres (to 33"). The Pro-Comp kit increases the height by approximately 100 mm (4"). This is also a 100 mm (4") lift kit, designed for the IFS 4 Runner and Hilux range. Factory O.E. specifications in relation to steering geometry, wheel travel and C.V. axle angle are maintained.